In Praise of the Unappreciated Mule. Let’s talk about mules. Horses are quick to grab Texas history’s glamour and glory, leaving little attention for their homelier, obstinate cousin. Can you imagine the Lone Ranger charging to the rescue on a mule? While acknowledging the mule’s notable lack of charisma, old-timers are quick to point out that the horse/ donkey half-breed is a forgotten hero. Christopher Columbus appreciated mules enough to take some on a 1493 voyage to what is now Haiti. George Washington bred horses, but started the mule industry in this country when the King of Spain gave him a mule as a gift. Washington felt that horses “ate too much, worked too little, and died too young” to be of much use on the farm. To early Texas farmers, buying mules was as important as buying a car or truck is today, but mules did not come with a 100,000-mile warranty or cash-back rebates. Texas led the country for a few years in the production of mules—well over a million of them in 1926, about the time that newfangled internal combustion engine really started catching on. Willie Huber of Belfalls, 96 when I interviewed him a few years ago, recalled that his first, most important purchase when he started farming for himself seven decades ago was a team of mules. He found four for sale at a farm about 10 miles west of Gatesville and went to have a look. He liked what he saw in three of the mules, but he had his doubts about the fourth one. He was right about the first three. Unfortunately, he was right about the fourth one, too. “That fourth mule wasn’t no count,” he ruefully admitted some 70 years later. In Harder than Hardscrabble, T.A.Wilhite described the traits he looked for back in his mule-trading days. The U.S. Army recognized the value of mules early on. Mules served in every American conflict between 1820 and 1945. They were essential to both the North and the South in the Civil War. A thousand marching soldiers required at least 25 wagons to carry supplies and haul heavy artillery from one battle site to another, and mules pulled most of those wagons. 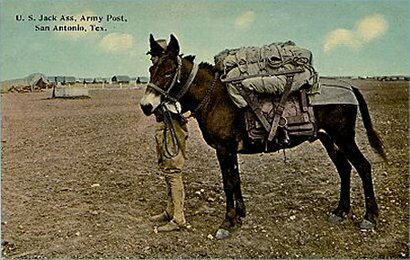 In Shavetails and Bell Sharps: History of the U.S. Army Mule, author Emmett M. Essin writes that the Army found mules to be stronger and more agile than either a horse or a donkey, able to carry heavier loads longer distances over more difficult terrain. “Mules were also sensitive, intelligent animals, more so than their parent stock. They quickly recognized approaching danger and knew by instinct how to avoid it,” he wrote. On the battle lines, however, mules often became conscientious objectors, recognizing the high probability of death the battlefield presented. Maybe that’s why you never saw a lot of mules charging into battle. Gradually, tractors replaced mules on the farm, leaving them with nothing more than a reputation for being stubborn. But a few places still pay homage the mule’s contribution. Texas is one of those places. 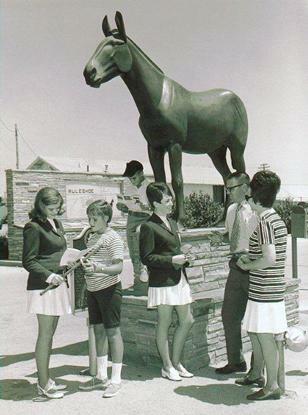 The National Mule Memorial is in— where else? —Muleshoe, and was financed with private donations, including 25 cents from a mule driver in Uzbekistan. The mule gets its just credit in Muleshoe. The mule is recognized also in the Coryell County town of Topsey, which is named for an early farmer’s favorite mule. Mule Ear Peaks, in the Chisos Mountains of West Texas, is an easily recognizable and aptly named geographic feature. 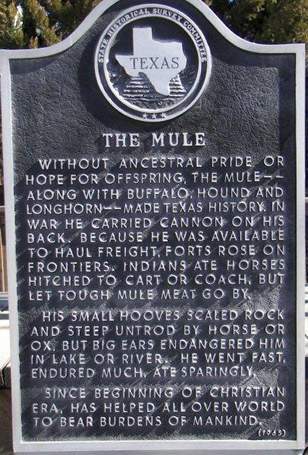 Still, even with its own monument, even with towns and landmarks named in its honor, the mule remains the Rodney Dangerfield of the animal world, getting no respect. To make matters worse, it is often confused with other equine critters, like donkeys. Remember: a donkey is just a donkey; a mule is a cross between a horse and a donkey, usually a male donkey and a female horse, but not necessarily. A cross between a male horse and a female donkey is called a hinny. Just don’t be a jackass and call a mule a donkey. Mules deserve a little more respect than that. This column is included in Clay Coppedge's "Hill Country Chronicles"